Balance is Propellerhead's first hardware product. 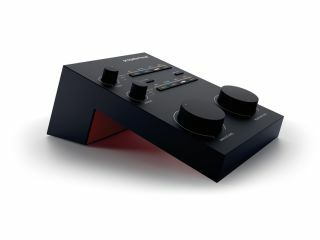 As well as announcing Reason 6, Propellerhead Software has also taken the wraps of Balance, its first audio interface (and, indeed, its first ever hardware product). This 2-in/2-out device will ship with Reason Essentials, the new cutdown version of Reason 6. It actually has eight input connections (so that you can record pretty much anything), and you can activate these at the press of a button. There are separate volume controls for monitors and headphones. Although you can use Balance with any recording software, users of Propellerhead products will be able to take advantage of special features. These include dedicated buttons to bring up the meter/tuner and to activate the new Clip Safe technology, which supposedly protects your recordings from clipping. Clip Safe — Never again a lost take because of inadequate level settings. The "built-in recording engineer" watches over your session and automatically heals any clipped recordings. Mac OS class compliant (no driver on Mac OS). ASIO drivers for Windows installed with the software. The Balance/Reason Essentials bundle will be available from 30 September for £379. Find out more on the Propellerhead Software website.